Pace Digital Gallery is pleased to present Me, My Camera, and I.
Curated by Jillian Mcdonald, the exhibition features four video artists who perform in their own videos using low tech, do-it-yourself methods. All four artists take found media as a starting point - whether Hollywood films, archival interviews, or an audio tape found in a junk shop; humour and a sense of absurd pathos run throughout the work. 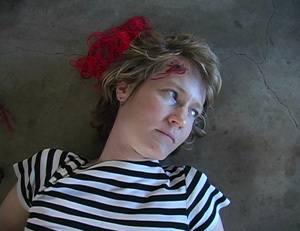 Kara Hearn is an interdisciplinary video artist. She makes quiet and absurd work about the way tragedies reside in the head; the way heroisms play out in the mind’s eye, the inside place where stories get conjured, dreamed, remembered. Hearn’s work has been screened and exhibited at such venues as Recess Activities, DiverseWorks, White Columns, The Luckman Gallery, Pacific Film Archive, New Langton Arts, the Walker Art Center, and the Dallas Video Festival. She received an MFA from the University of California at Berkeley in 2007 and was a Core Fellow at the Museum of Fine Arts, Houston from 2007-2009. She currently works and resides in Brooklyn, NY. This video takes a look at the way travesties large and small hang about; the way regret, grief, humiliation, and tension play themselves out after the fact, shifting in and out of consciousness, repeating endlessly, and being re-made along the way. Shot completely alone by the artist using only costumes and props that were on hand. These reenactments are the artist's effort to degrade and venerate the heroics of Hollywood movies. By utilizing the techniques of cinema in the simplest possible ways she hopes to recreate narratives that are stripped of everything but the pathos inherent in the medium. 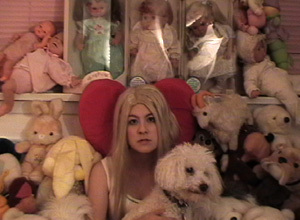 Alison S. M. Kobayashi is a visual artist working in video, performance, installation and drawing. She was born and raised in Mississauga and is currently working between Toronto and Brooklyn. 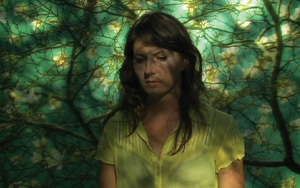 Her interest in found narratives resulted in two video works, From Alex To Alex and Dan Carter. Finding a lost letter in the first case, and a discarded answering machine tape in the second, Kobayashi imagines identities for each person mentioned in the narrative and then performs all the roles herself. In 2006 she won the TSV Artistic Vision Award for Best Local Short Film at the Toronto Reel Asian Film Festival and in 2007 was awarded the Mississauga Arts Award for Best Emerging Artist. Her films have been shown in Canada, the U.S., Spain, the Netherlands and Hong Kong. "Dan Carter donated his answering machine to a secondhand store. Dan Carter did not remove the cassette tape. So I took it. This film is based on the messages." "In the fall of 2003 I found a letter on the Winston Churchill Blvd QEW overpass. It was labeled From: Alex To: Alex. This is a film based on the contents of that letter." Frank McCauley, a Jacksonville, FL native, received his BFA in painting from Winthrop University, and his MFA from Syracuse University. Frank has been the Director and Curator for Spark Contemporary Art Space in Syracuse, NY and is currently the Assistant Director and Chief Curator for the Sumter County Gallery of Art. As an artist he has been in numerous group exhibitions both nationally and internationally and has had solo exhibitions in CA as well as NY. Whether through printmaking, painting, video or performance, his work extends from an internal investigation of childhood role models, popular icons and cultural stereotypes and questions commonly held assumptions of how we construct our own individual identities. 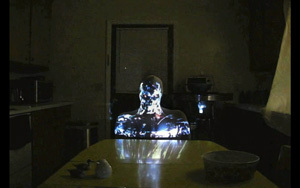 Action at Home and The Sentinel utilize a “projection suit” in attempts to articulate mock relationships between real and fictional characters, their contexts, social environments and physical surroundings. They operate on the level of costume, disingenuous charade, and nostalgia and allude to the desire for a different kind of make-believe, an actual physical metamorphosis, but which ultimately fail, due to its impossibility and thus are relegated to the arena of fantasy and play. Adie Russell was born in Pittsburgh in 1971 and grew up around Europe and the US. She currently lives in upstate NY where she is hard at work on her upcoming show Most Extreme Perfect That Exists. These videos are part of an ongoing project in which Russell re-contextualizes audio recordings from the 1950s and 1960s. In displacing the original visual cues and those judgments that would ordinarily coalesce around them, she interrupts the historical narrative and brings fresh meanings to the language. Her subject matter is often the complex relationship between nature and selfhood and by bringing together two temporal spaces: the historical moment of the audio recording and the space inhabited by the artist, she aims to evoke an experience that is never fully grounded in time or identity.